For the first time in my life, or at least since I was 15 with a tennis racket in my hand, I won something. This wasn't a medal or a trophy though, this was a helicopter flight! 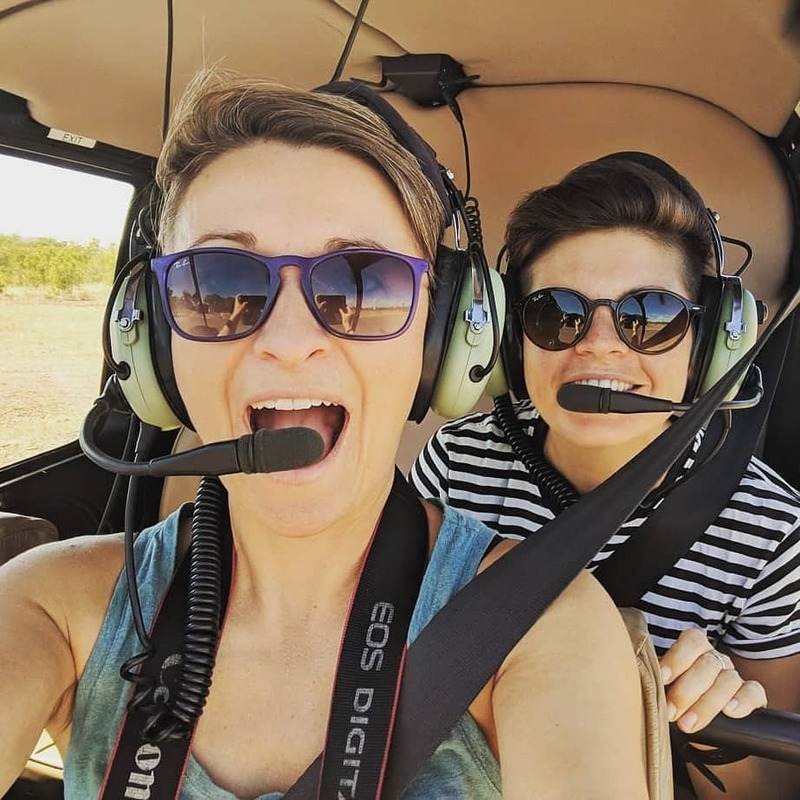 Thanks to an Instagram photo competition during the Kimberley Moon Festival that we had attended on Saturday night, Tuesday morning found us soaring through the skies in the capable hands of a HeliSpirit pilot. 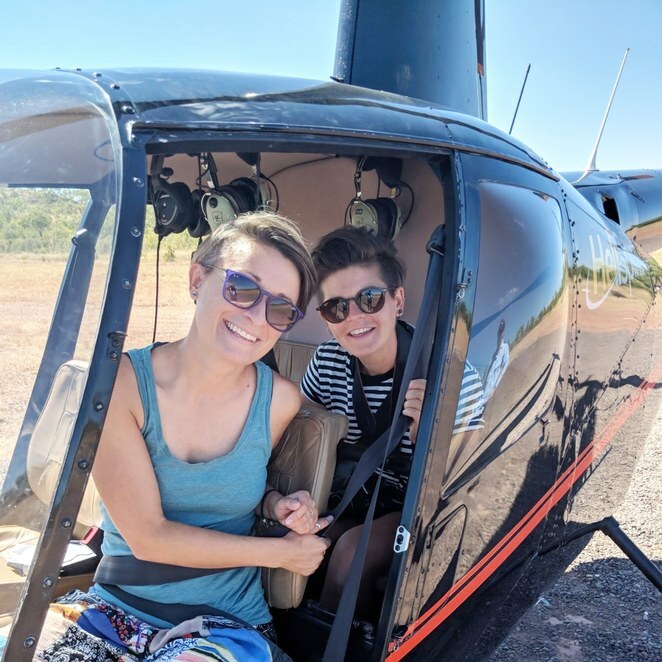 By the time we found out, we were the lucky winners we had already left Kununarra in WA and started the long drive north to Darwin. The friendly HeliSpirit team suggested that rather than drive four hours back so that we could fly over the Bungle Bungles as was the designated prize, that we continued on our journey to Katherine and took a flight there. This immediately put a smile on our faces as an extra 8 hours on the road retracing old tyre tracks would have been a bit of a downer, especially for our buses fast ageing odometer. After a night at Victoria River Roadhouse, which is one of the nicer roadhouses we have parked up at, we finished the journey to Katherine on Tuesday morning. The HeliiSpirit office and helicopter pad is just 20 minutes outside of the town as you head into the beautiful Nitmiluk National Park. The pilots who greeted us, clearly knew that they had one of the best jobs in the world and they were eager to get us into the sky and share their knowledge of the area as well as the chopper. After a few obligatory snaps next to the helicopter, we were strapped in and ready to go. Jot only looked mildly afraid as she realised there were no doors on the front of the plan and I had generously opted for the back seat. Headphones on, safety checks done, Jot thoroughly checking she wasn't going to fall out mid-flight, and we were ready to go. As this was brand new territory for us, we weren't sure what to expect but within moments the propellers had reached full speed and the chopper gently rose from the helipad, our bus getting smaller and smaller as we left the dusty ground behind us. The flight was due to take 45 minutes and the pilot immediately started his informative commentary about which direction we were headed and what we could expect to see. As we looked down, we saw sacred Aboriginal rocks to one side and the Katherine River running along the other. The view of Katherine Gorge from the sky blew my mind and I was amazed you could see how clear the water was from that height. 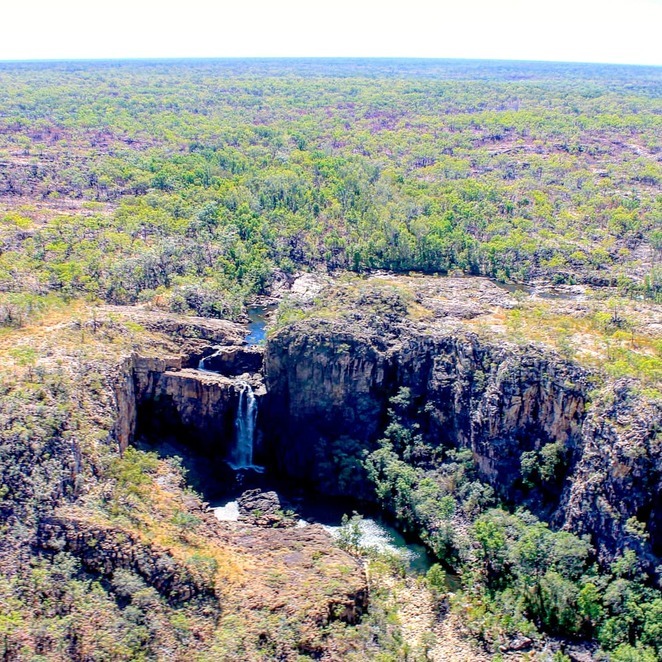 During the 45 minutes, we zoomed over rivers and valleys, hovered above waterfalls including my favourite, Edith Falls. We really got to take in the beauty and the sheer size of the place where "the outback meets the tropics", while learning more about its history. 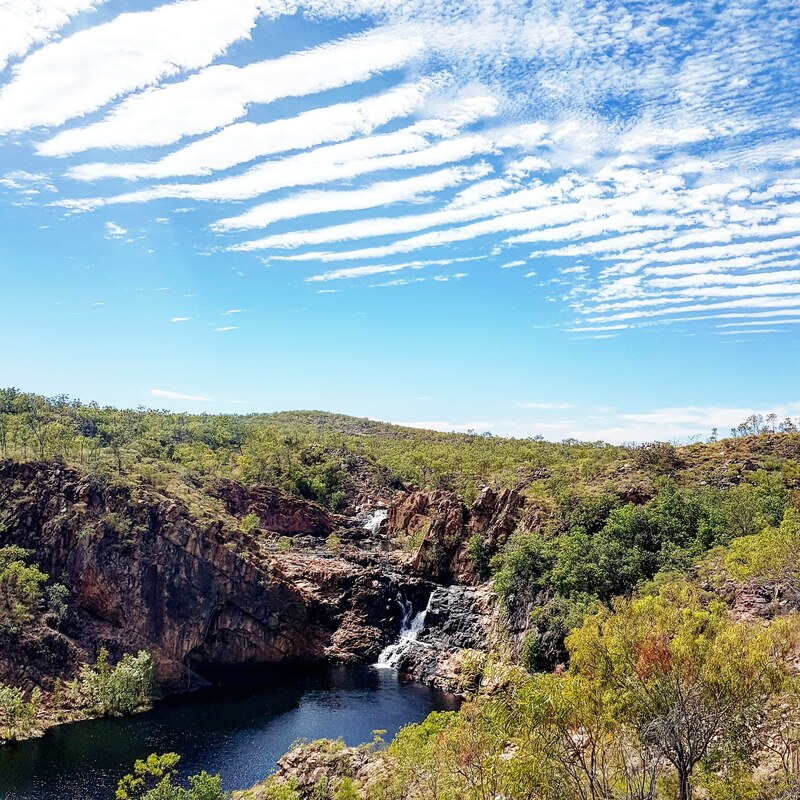 Both Katherine and Edith Falls are named after the daughter of explorer John McDouall Stuart when he passed through the area in 1862 we learnt. 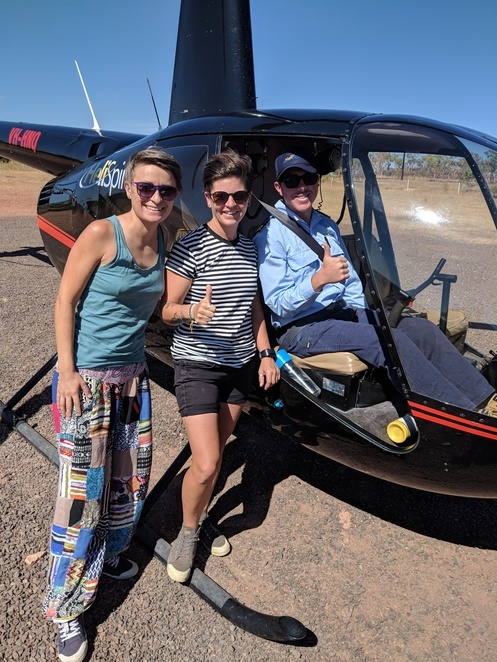 Our pilot and commentator also pointed out areas of importance to the aboriginal communities who have called the land home for thousands of years, in particular, the Dagoman people, Jawoyn people and Wardaman people. When we touched down 45 minutes later, I felt enriched. I was more informed and had seen more of the Northern Territory than hours of driving or hiking could have achieved. The whole experience was incredible, from the stunning sights to the expert and friendly pilots. Even if you can't win it in a competition, I would recommend anyone and everyone takes to the skies to utterly absorb the vast beauty of the area. Thank you HeliSpirit! I'm sold. It looks fabulous!